Could a crocodile be lurking in the River Lea? 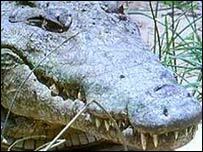 A crocodile living in a secluded stretch of river is among explanations for vanishing wildlife in east London. Boat trippers on the River Lea watched as a Canada Goose vanished "almost instantaneously", apparently dragged beneath the water by a mystery beast. Mark Gallant, of the Lea Rivers Trust, who was on the boat, said: "Whatever that thing was, it had to be big". Cygnets have also gone missing, but experts say large fish, or a Caiman, could also be responsible. Mr Gallant took five people from the Inland Waterways Association up the Lea on 10 July to see how it looks before development starts on the Olympic Village for the 2012 Games. As they sailed up on the Old River Lea stretch, not usually accessible to the public, they started noticing strange holes in the river banks. Then a Canada Goose vanished from the river's surface - apparently pulled under the water at speed. While speculating that it may have been a pike or an 8ft European catfish, Mr Gallant, 41, decided not to take any chances. "I felt responsible for these people and I wasn't about to go over and investigate, or get too close - put it that way," he told BBC News. "I'm not 100% certain that it's a crocodile, but I'm sceptical about the idea it could be a pike...I would've thought, if it was a pike, there would have been a bit more of a struggle. The way this thing disappeared was almost instantaneous." A spokesman for the London Wildlife Trust said it was not impossible that a crocodile may be living in the Thames, as exotic pets are often released into the wild. "Someone could've released a crocodile, it could survive a while as there's plenty of food and the climate is warm enough, although they might not survive the winter." But he added, there was no hard evidence of a crocodile in the River Lea, and there were other large fish which could have grabbed the goose. "The smart money is on a pike," he told BBC News.